Set the tone for your important milestone with custom designed invitations. Select paper stock, envelopes, and card formats that suit your event needs. Flat printing, letterpress and foil available. Announce your engagement in a variety of formats, including a single card in envelope, postcard, or other creative style. Flat printing, letterpress and foil available. 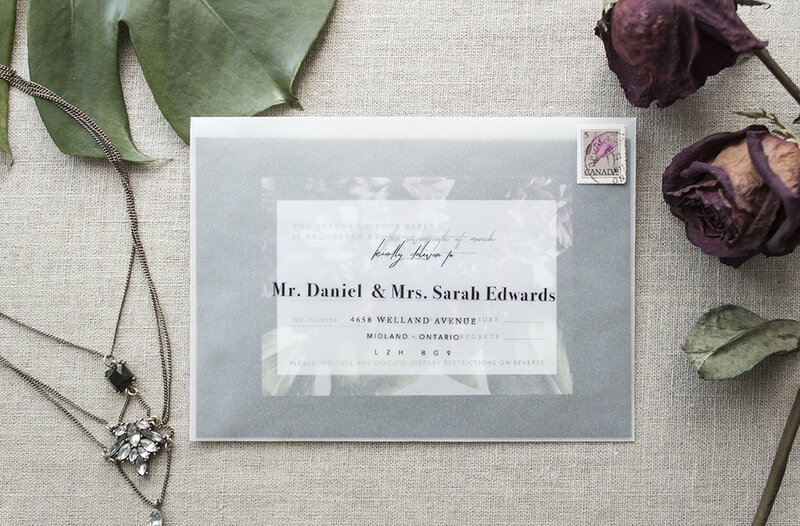 Have your guests’ names and addresses printed directly onto envelopes of your choice in a design that coordinates with the printed piece(s) inside. Ink available in multiple colours, excluding white and metallics. For dark envelopes, printed labels available. Organize your guests with a visual display of your intended seating arrangements. Individual cards or large format printing available. Infuse your event style throughout the venue with printed pieces like menus, programs, place cards, table numbers, itineraries, etc. Say thanks with custom designed single or folded cards. Show off special photos from your wedding or event and continue your style from start to finish. Includes envelopes with address printing. Communicate what your business is all about through graphic elements, colour selection, and memorable tag-lines. We’ll work together to establish your brand’s tone and ensure an accurate and engaging first impression. For restaurants looking to refresh their main vehicle for communication, printed menus are critical. Choose from a variety of paper stocks and collaborate on a unique design that suits your establishment. Resolve a tough space in your home, office, or retail space with recommendations for layout, colour selection, and finishes. Provide images, floor plans, and measurements and receive Photoshop or 3D SketchUp renderings to fully visualize the designed space. Engage your audience with relevant and original content. Available for guest writing, editing, and photography/graphics for blog, instagram, and facebook posts. Promote your Etsy, Shopify or other online business with professional and consistent product photos. A variety of image options available, including styled flat-lays. Not super tech-savvy? Send over any digital tasks including vectorizing, image resizing, colour correction, etc.